As you grow and prioritize your social media efforts, you need to consider which social networks work best for your business or brand. Even if you already have a company blog, Tumblr is another platform you should explore. One of the greatest benefits of becoming a part of the Tumblr network, is that you will be among members who actively participate in a sharing and liking-based ecosystem. Once you start posting and reading content on Tumblr, you’ll realize it can be very different than other traditional blogging platforms. Most Tumblr bloggers post short blog posts, and much of the blogging is heavily image-based. Use cues from the way Tumblr bloggers post their content to guide your strategy on this unique platform. Head to Tumblr.com to sign up for your new blog. You’ll be asked to provide your email address, password, and your preferred Tumblr URL (yourbusinessname.tumblr.com). Once you’ve authenticated yourself as human (as opposed to a spambot), you’re more or less ready to go. When you first get to the Tumblr dashboard, you’ll be faced with two choices: make your first post, or pick your theme. As a business or brand owner, you’ll probably want to pick a theme first. Try and find a theme that closely resembles your brand’s existing style. When you click on “Customize appearance” from the dashboard, you’ll be presented with the default Tumblr theme, some sample posts, and a series of drop-down menus across the top of your screen. These menus are where you’ll customize your Tumblr blog, as per the following steps. Give your blog a title (which will show up as your title tag) and fill in some details about your blog from the “Info” menu. You can choose a new theme from the “Theme” menu. There are a number of free and paid Tumblr themes to choose from. Most themes are customizeable. The “Appearance” menu gives you options to change things like background and text colors. The “Pages” menu allows you to add multiple pages to your blog. You can link to any other websites you have from here, such as your company’s website or your YouTube channel. From the “Advanced” menu, you can change your custom style sheets (CSS) and enable advanced features — like a mobile layout for your Tumblr blog. Unlike traditional blogs, many Tumblr themes don’t provide a commenting feature. If you want to enable comments on your Tumblr blog, you’ll have to find a theme with that feature. Some themes also offer the ability to turn on an “Ask Me Anything” feature. With this feature enabled, whenever you log in to Tumblr you’ll see if anyone has asked you questions. You can then answer the questions with a post to your Tumblr blog. One of the unique features of Tumblr is that it customizes the look and feel of the interface based on the type of content you want to post on your Tumblr blog. There are seven ways to share content, and many Tumblr themes will display these types of content in different ways within their design. Text: The text option on your Tumblr dashboard will give you the ability to create a blog post similar to any other blogging platform. You can add elements like text, links, and images. Photo: Unlike other blogging platforms, you don’t need to give photos a blog post title. Images show up at the top of your page and you can add a caption and links. Quote: Tumblr bloggers love to share short bits of content, such as quotes. There is also a place to credit the source of your quote. Link: Simply add a title and a link for your blog followers to check out. Chat: This doesn’t embed a chat on your page, but it does allow you to post chat-like content or dialogue in a post. The article will be displayed in a grid that makes it easier to read. Audio: You can upload or point to an MP3 on the web and it will be displayed on your blog in an embedded audio player. You can also post audio from your mobile phone; record it and post it from the Tumblr mobile app. Video: Use this option to upload your own videos or embed videos from somewhere else on the web. When you’re starting out on a new social network, you want to consider what your business or brand has to offer that community. Take a look at the type of content you create, and what you post on other social networks — and consider what the best complement to Tumblr will be. Remember to keep your posts short, likeable, and “re-blogable”. When people on Tumblr like your content, they’ll re-blog it — or share it on their own Tumblr blog. Photos are also shared quite a bit on Tumblr. This may be a good place to start to see how the community reacts to your content. 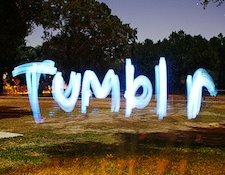 Consider how Tumblr can benefit your brand by reading our related article: Why Brands Should Keep an Eye on Tumblr. Has your brand or business made the leap into the Tumblr community? Share your success stories in the comments below.